2009 special digitally remastered and expanded two disc (CD + PAL/Region 0 DVD) 35th anniversary edition of the veteran British Hard Rockers' 1974 album comes with a crisp new remaster, and a host of collectable extras. The CD features the original album remastered, plus a clutch of tracks remixed by Glenn Hughes at Abbey Road Studios especially for this release. The DVD contains the original Quad mix of the album presented in both 5.1 surround sound and stereo. 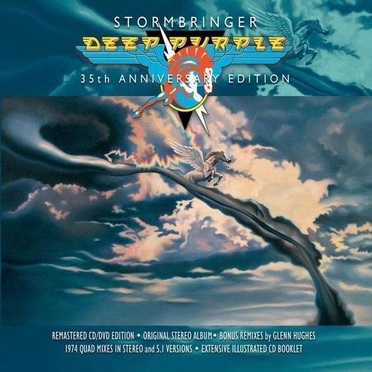 Stormbringer was the ninth studio album by Deep Purple, originally released in November 1974. (and featuring the Mark 3 line-up of the band that included David Coverdale on vocals and Glenn Hughes on bass) this album, much more prominently featured the soul and funk elements that were only hinted at on previous album Burn. EMI.